Commonly referred to as the Gold or Platinum Coast, the postcard-perfect west coast of Barbados is known for its calm turquoise waters and beaches that match its golden moniker. 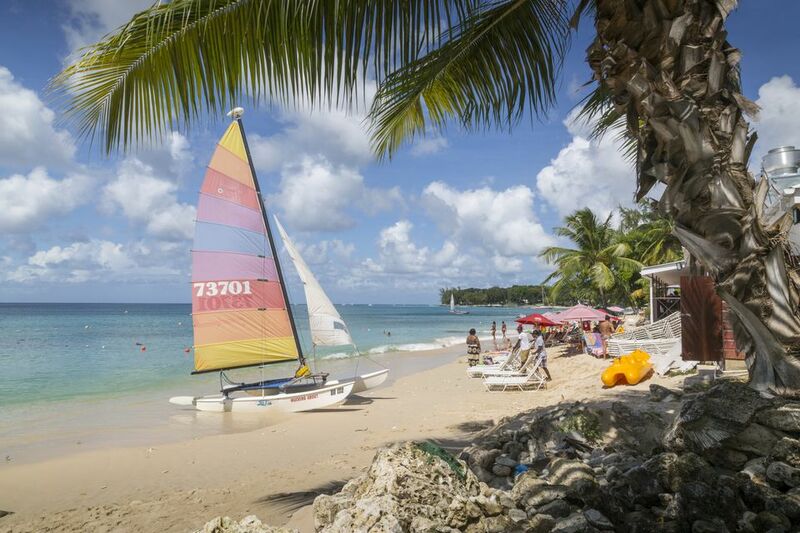 But beautiful beaches aren’t the only reason to visit Barbados’ west coast. They’re definitely a draw, and there’s plenty of beach-hopping to be done, but the area also offers several other worthwhile activities and attractions that make this part of the island so fun. If you’re planning a Barbados vacation, here are five of the coolest things to do along the west coast. Polo is a big deal in Barbados and there are many opportunities throughout the island to catch a match or two. But have you ever thought about learning the sport yourself? If so, Apes Hill Polo Club is a world-class facility on the island’s west coast offering lessons for every skill level (even complete beginners). While you might be skeptical about the potential of hitting the ball while atop a moving horse, immersive instruction is such that even the least coordinated among us have a good shot at making contact during a first lesson. Upon arrival you’ll meet the horses, get a safety briefing, learn the basics of holding the mallet and hitting the ball before getting on a horse. Detailed instructions are provided and everyone can go at their own pace. One of the best ways to experience the beauty of Barbados’ west coast is to see it from the water, something you can do courtesy of a relaxing catamaran ride. Seaduced Luxury Charters offers both private and semi-private daytime and sunset cruises which sail up the west coast and depart at either 10:30 a.m. to 3:30 p.m. depending on your preferred time of travel. A sunset cruise gives you the best of both worlds—a sun-kissed view of the scenery to start, and then an epic sunset, making it the preferred option for many. Catamarans come complete with snorkel equipment and a stand-up paddle board for anyone who wants to get a bit more active, as well as a swim platform for easy access in and out of the water. The island counterpart to acclaimed sister location in London, Daphne’s is an award-winning restaurant on the west coast and well worth including on your Barbados itinerary. Part of the island’s acclaimed Elegant Hotels Group, the restaurant is a popular choice with celebrities visiting the island (including Rihanna), but the vibe leans much more toward low-key than exclusive. Chef Michele Blasi creates Italian-leaning dishes with an subtle island twist using fresh-caught seafood and local produce. Daphne’s is also known for their creative list of cocktails, including a watermelon martini. Barbados is home to more than 80 pristine beaches, so you know there’s a stretch of sand waiting for you no matter where you are on the island. But if its calm water conducive to swimming, snorkeling and watersports you’re after, choose a beach on the west coast. The tranquil water of Payne’s Bay makes this an especially prime spot for just about any water sport, including paddleboarding, snorkeling, windsurfing, and kayaking. Payne’s Bay Beach is located between Holetown and Bridgetown in St. James Parish. The beach is lined with luxury hotels, but there are public access points to the beach from the main coastal highway. Historic Holetown is Barbados’ oldest settlement, and if you’re on the west coast, the quaint town has several attractions of interest. If you’re in the mood to do some snorkeling, Folkestone Marine Park can be found about a half-mile north of Holetown, and there you’ll find equipment rental, marine life information center and museum, picnic tables, and a protected area for snorkeling the calm, protected water. Shoppers will want to head to Limegrove Lifestyle Centre, a small but stylish mall filled with upscale brands as well as a movie theater complete with food and drink service right to your seat. For a more locally inspired shopping experience, stop by colorful Chattel Village. The small outdoor shopping complex has been built to reflect the traditional Barbadian wooden homes, known as Chattel Houses and small shops sell local fashion, accessories, handicrafts, and souvenirs.